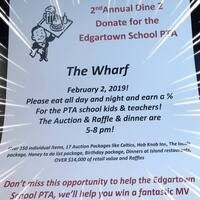 Donate for the Edgartown School PTA. Eat all day and night and earn a % for the PTA school kids and teachers. The auction and raffle and dinner are from 5 to 8 p.m.